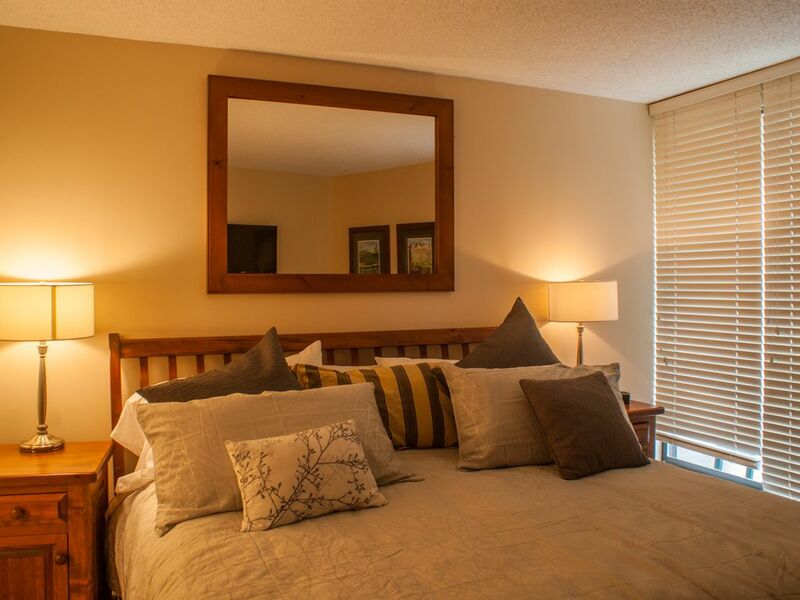 Hypoallergenic bedding in the bedroom, a vanity sink outside of the main bathroom and a small balcony showcasing some of the best panoramic views Whistler accommodation has to offer. The Marquise on Blackcomb itself also has great common facilities including a lounge, exercise and fitness room, outdoor pool and hot tub area and common area laundry. Combine great slope access, sought after building amenities and a comfortable and cared for condominium and you’ll understand the allure of this fantastic Whistler rental property. This property is professionally managed with 24/7 in-resort guest support. It includes free wireless internet and a digital cable television package. Our room at the Marquise was amazing. We had a mountain view from both the huge living room window and the bedroom deck window. The kitchen was well stocked with pots, pans, plates, glasses and everything else we needed. The condo was clean and well organized. There was a TV and cable in the living room and the bedroom. We didn't use the gas fireplace since it was warm while we were there, but in winter it would be nice. We noticed there was an exercise room and pool, although we didn't use those facilities. Overall a great experience. We would definitely recommend the condo to others. Thank you for the great review. We appreciate your comments. We had an awesome time at Crankworx. And a couple of epic mtb rides on trails around Whistler. Glad to hear it was an awesome trip. Slope side Marquise 407! Awesome Stay! Marquise 407 was a great room, newer berber carpet and kitchen and bathrooms have been updated in the last few years, with new cabinets’, tile and granite.I was a bit nervous about staying at the marquise after reading some of the other reviews. The marquise is a bit older than some of the other condo’s in the area. Yet, room 407 is completely remodeled and new. The pool, hot tub and sauna are great. Had the hot tub to ourselves every night. The underground parking is convent for accesssing the rooms. The ski lockers on the first floor are convent. This is ski in and walk out. About 100 yards to the slopes. Or you can wait for the free bus outside the condo lobby, the bus will take you to the village or the base of the mountain. The room left privacy for the adults with a private balcony in the bedroom and a queen size pull out sleeper sofa in the living room, which was great for our daughter. I would diffenently stay here again! Thank you for reviewing this property. We hope to welcome you back. Thank you for the review. We are delighted to hear you had a great stay. Family and I stayed for 4 nights just before the holidays. It is in a great location with about a 2 minute walk to the slopes. Hot tub and pool are nice (pool is heated to about 80 so good for swimming in winter). Unit is well kept but small. If you are bringing food note there is only a 1/2 fridge in the kitchen and per Canadian law there is no condiments of any kind provided. Building is on the #5 bus route so convenient to get to village (about 10 minutes). The building is a bit dated but the unit is nice, met our expectations and the price is reasonable. We'd stay here again. Thanks for the review. We hope to welcome you back again soon. Great 1 BR condo, perfect for our stay. Nicely furnished, good facility, easy access to town (walking distance). Lovely view of tree tops and adjacent mountain. We also enjoyed having the kitchen, dining area and propane fireplace. Hot tub, year round pool & fitness room on the main floor are good perks. Excellent value. We'll be back.